런던, 잉글랜드의 제너레이터 호스텔 런던 | 호스텔월드에서 예약하세요. 번역 Hostelworld에 손님 발전기 호스텔 런던 깨끗하고 안전한 '좋은 및 전문 직원과 잘 조직 된 호스텔'입니다 말했다. 우리는 '전 세계에서 좋은 사람들을 만나는 동안 좋은 장소가 조금 놀러와 맥주를'여행자가되어 우리에게 자신의 '생동감 있고 대기'줄을 좋아한다. 우리의 사용자는이 호스텔은 러셀 [광장] 지하철역에 '만 도보로 3 분, 킹스 크로스 역 [과] 버스 세 분 6 분 말한다. It's the ideal spot to enjoy London from, everything you need to see is minutes away by tube. You'll never run out of things to do in the UK's capital. You just have to decide where to start and we can help you with that. When you have seen and done it all for the day head back to Generator and unwind. It's a destination in its own right and a great place to socialise and reflect on your experiences of the day. 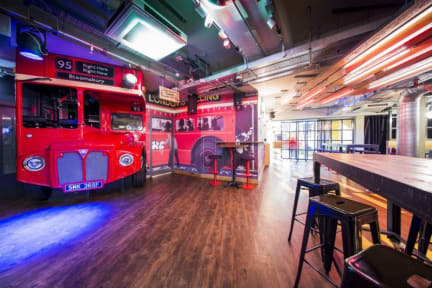 Head to the bar and chill out areas to get yourself a well deserved drink or two. It's lively, friendly and un-missable. We've also got great beds for sleepy heads and of course you'll be enjoying London life in the most authentic surroundings. 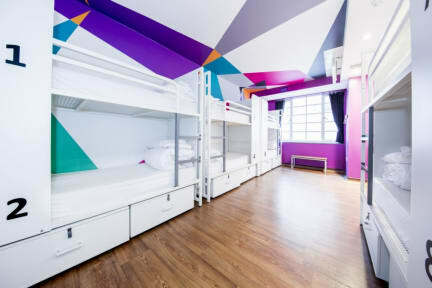 Choose from a great selection of rooms, from Dorms, to Quads, to Private rooms with innovative mod cons. Fast and free Wi-Fi is all yours too. To get the most out of your stay visit the travel shop and our city experts will help you devise an itinerary that will take you to all the hidden treasures this dynamic city has to offer. You'll have to stay longer to fit it all in but you'll not need convincing of that. We'll see you there soon. Stay connected. Free across most areas. (public areas only at the moment) Internet terminals also available for a small charge. Order a classic cocktail. Open from 5pm-2am with fun and games every night. International breakfast available upon request: £7.50 if booked online and £9.50 on site. Delicious meals available between 5-9pm every evening. A dish of the day will also be available together with the bar snack menu. Vending machines available for night owls to satisfy the midnight munchies. A wide selection of contemporary Privates, Twins, Triples & Dorms, with crisp white linen all available at great rates. Towels included complimentary in Twin rooms only. Shared showers on every floor. Open 24 hours a day where you can wash, dry and iron for a small fee. No need to worry about arriving late or early. The Generator Reception is open 24 hours a day with a duty manager who's always around to help. Secure luggage room is available so you can sightsee without dragging your bag with you. All our staff are multi lingual and on hand to help you with whatever info you need. Purchase tickets, tours and a whole lot more including phone and postal service. We will help you make the most of your stay. Undecided? Take advantage of our complimentary guided walking tour available daily. Unfortunately guests under the age of 18 are not allowed to stay in the dorms . Bookings of 10 people or more will be contacted in advance with our Group T&C's which include prepayment 4 weeks prior to arrival. 위치 정말 좋다. 하지만 6인실은 그냥저냥. 전체적으로 보면 지낼만 한 곳. 저렴한 맛에 쓸만한 정도입니다. 룸 자체는 괜찮았지만, 화장실 상태가 엉망이라 쓸 때마다 불만이었네요. 그래도 다른 외국인들과 친해지고 싶고, 여행지에서의 숙박에 큰 기대치가 없는 사람이라면 사용하기 어렵지 않을 듯 싶어요. 그리고 5층까지만 엘리베이터가 있어 6층은 걸어올라가야 한다는 단점.